The freshly plucked Camellia sinensis tea leaf has a natural tendency to oxidize (like a cut apple) if it is bruised or crushed. 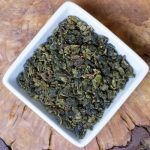 Oolong teas are partially oxidized teas and are possibly the most challenging to manufacture and to understand as a single category. The tea leaf is intentionally bruised and/or rolled and allowed to oxidize to the specifications of the Tea Master. Once the optimum amount of oxidation is achieved, the leaves are fired to stop the oxidation and to remove moisture. China and Taiwan are the primary oolong producing countries and each have a different approach to processing and categorizing these teas. Oxidation of oolongs ranges from 8% to 70%—the teas are typically categorized in the following groups: Pouchongs; Jade Oolongs; Amber Oolongs; Champagne Oolongs and Aged Oolongs. If you are a scented tea lover (think Jasmine) you will really like this tea! It is unique with its Magnolia scent and makes a wonderful aromatic cup.